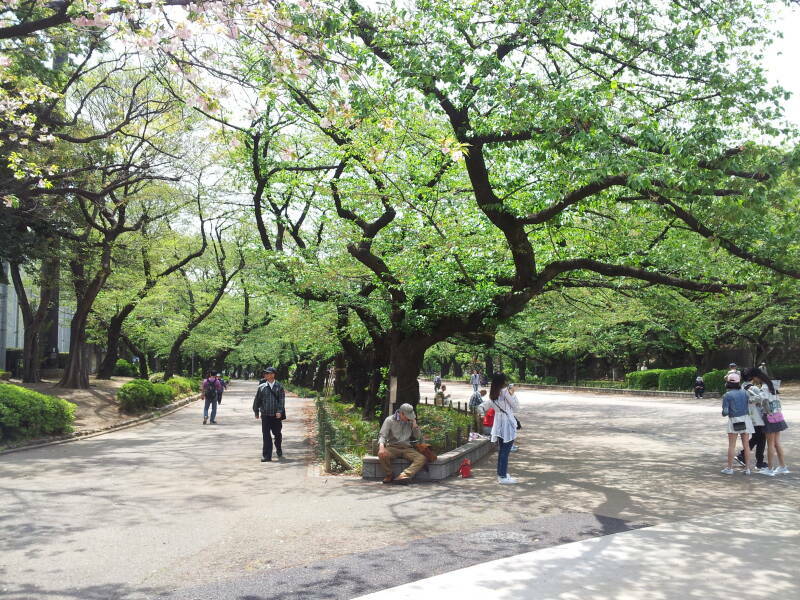 Ueno Kōen, or Ueno Park, was the first public park in Tōkyō. 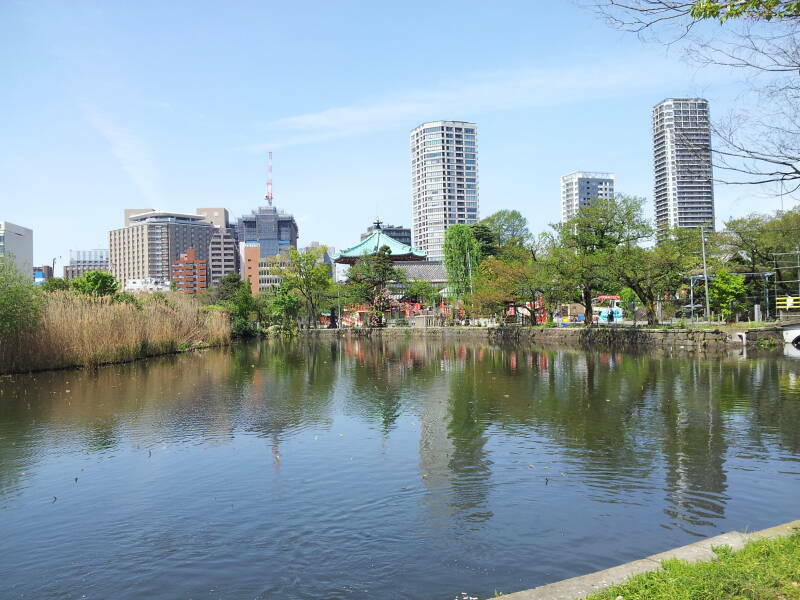 It is now one of the largest parks in the city, and Japan's most popular city park. Over ten million people visit it every year. The park occupies the former site of the Kan'ei-ji Temple. 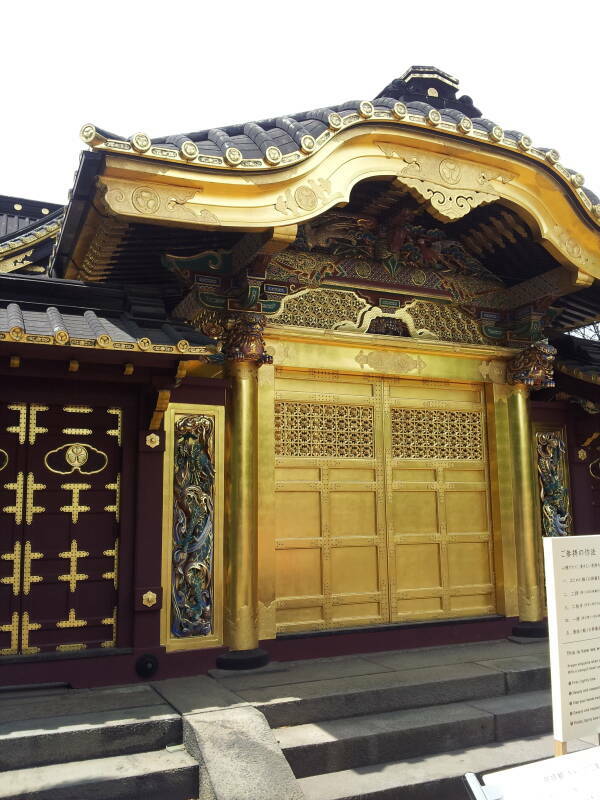 The Tokugawa shōguns built the temple to guard Edo Castle against threats from the unlucky direction of north-east. 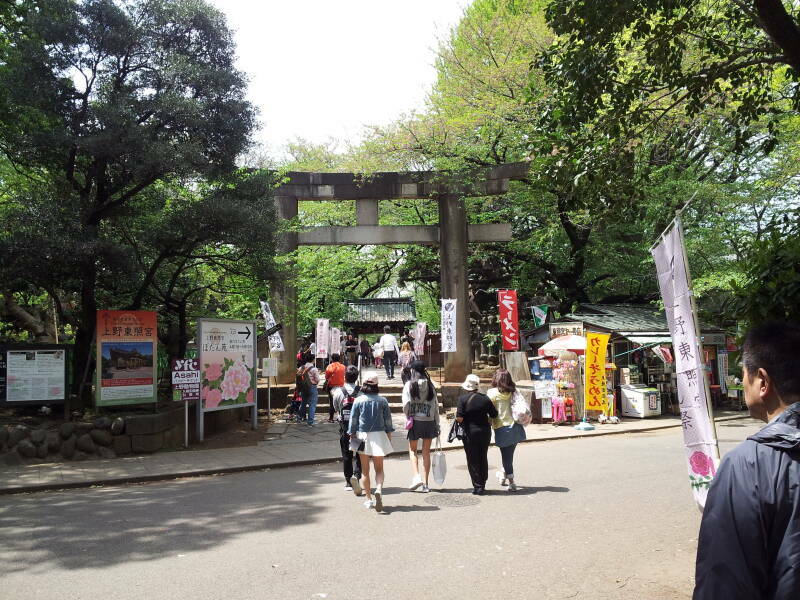 Now it's a pleasant place to visit, with museums, temples, shrines, and flowering trees. 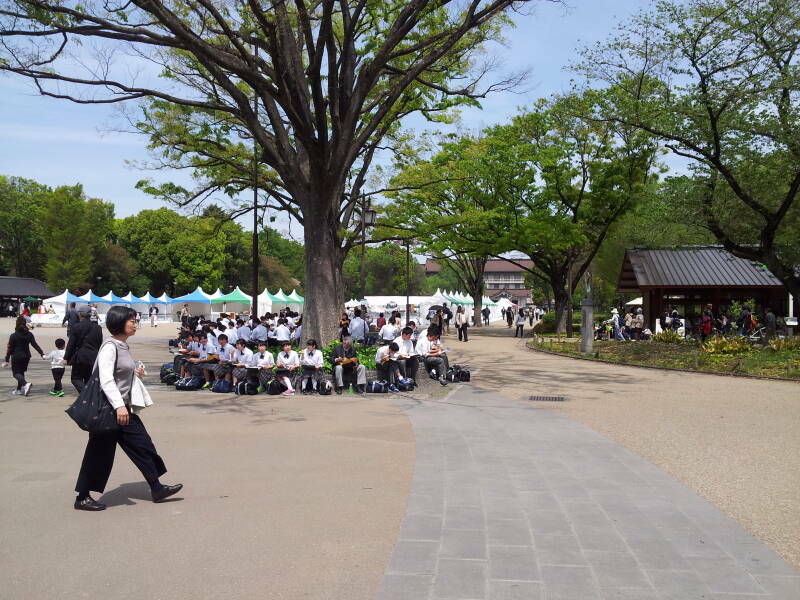 Ueno Park is next to Ueno Station. Both lie just to the east of the Asakusa district and its Kappabashi district. Ueno Station is a major commuter hub. It has traditionally been the main terminal for long-distance trains from Tōkyō to northern Japan. Now the Shinkansen lines continue south to Tōkyō Station, a little further toward the center of the city. However, six Shinkansen lines still call here. 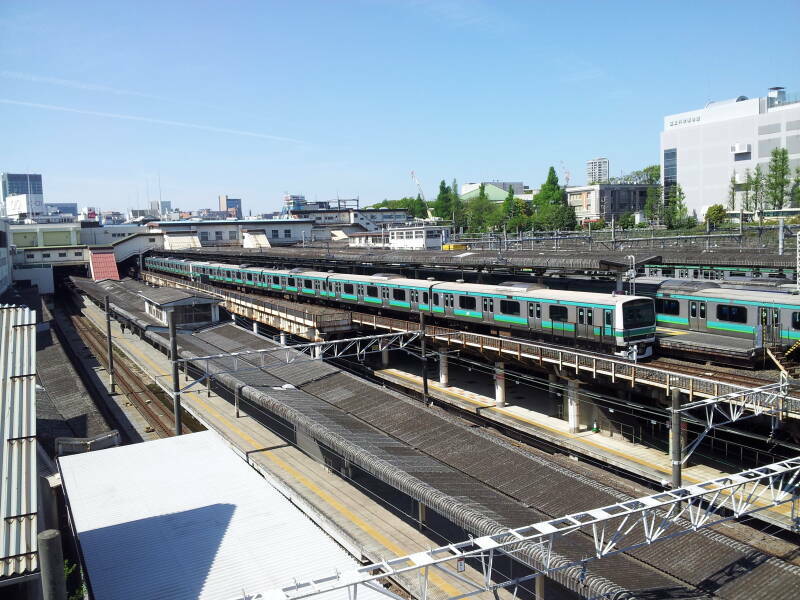 Other JR lines also serve Ueno Station. The Ginza Line and Hibiya Line of the Tōkyō Metro also call here. The underground line connecting Ueno to Asakusa Station opened in 1927. It was the first segment of the Tōkyō Metro. There are also inter-city bus lines here, running at least as far as Kyōto, Nara, and Osaka. Tenkai, a priest of the Tendai sect, founded the Kan'ei-ji Temple in 1625. This was during the Tokugawa shōgunate. 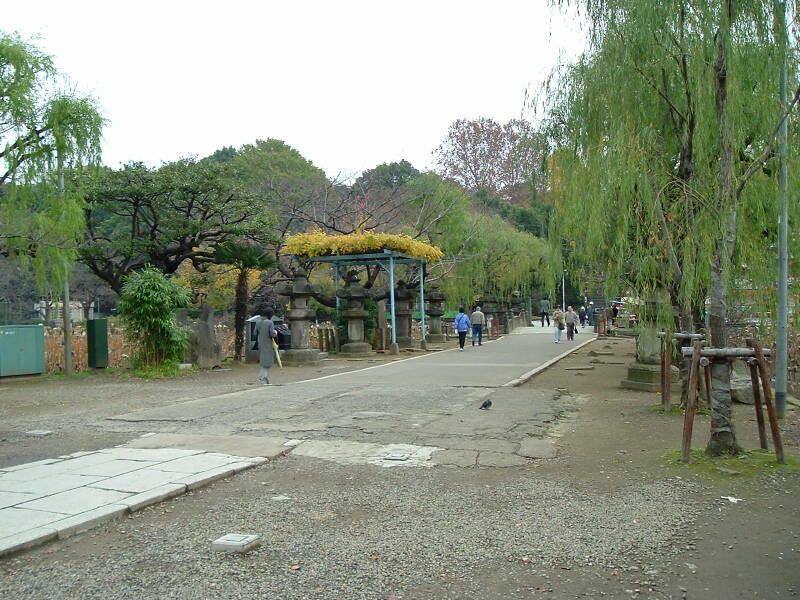 Six of the 15 Tokugawa shōguns were buried here. The temple was enormously wealthy and powerful, and the temple complex included over 30 major buildings. 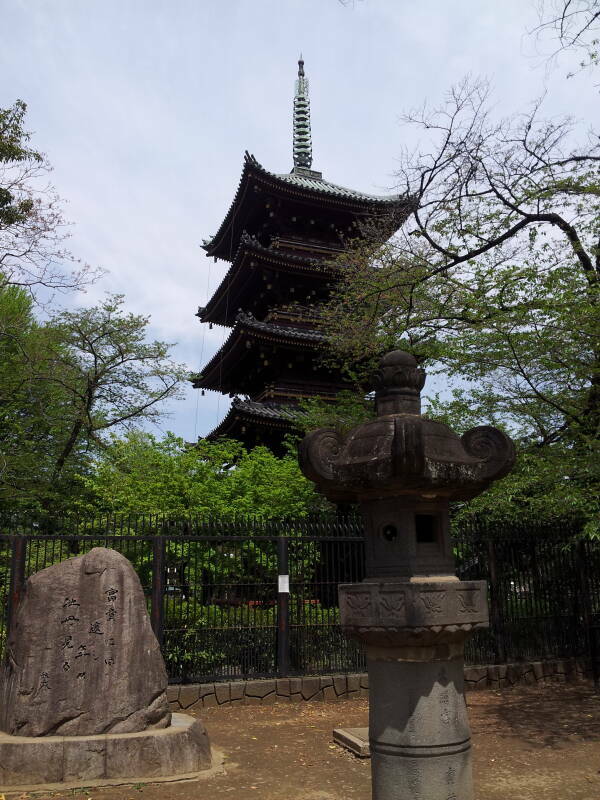 The temple was destroyed during the Boshin War of 1868-1869. The Boshin War or Boshin Sensō, also called the War of the Year of the Dragon, was a civil war fought between the ruling Tokugawa Shōgunate and the forces seeking to return power to the Imperial court. The U.S. Navy had forced Japan to open its ports to western ships in the early 1850s. Western forces had recently taken great advantage of China in the recent Opium Wars. Now the Shōgun was unable to protect the nation against Western outsiders. The people lost confidence in the Shōgun. Forces favoring the Emperor, largely a figurehead since the founding of the Kamakura Shōgunate in 1185, began fighting to return the Emperor to power. The Boshin War was the military conflict within the Meiji Restoration or Meiji Ishin, the restoration of imperial rule to Japan. The Battle of Ueno was a crucial battle of the Boshin War. It occurred on July 4, 1868 in the western calendar, or Meiji 1, 15th day of the 5th moon in the Japanese calendar in use at the time. This battle almost completely destroyed the Kan'ei-ji Temple complex, and the Imperial government confiscated the site. The Meiji restoration is often romanticized as a "bloodless revolution", but it was in fact just as violent as one should expect from a civil war within a nation whose culture revered warrior figures. There were, at the very least, 120,000 troops and 3,500 casualties. Western military technologies including the Gatling gun, ironclad warships (such as the Kotetsu), Armstrong howitzers, and Minié rifles played roles. By early July, 1868, the revolutionary forces had occupied most of Edō, today called Tōkyō. The Tokugawa troops had already surrendered Edo Castle, on the grounds of today's Imperial Palace. 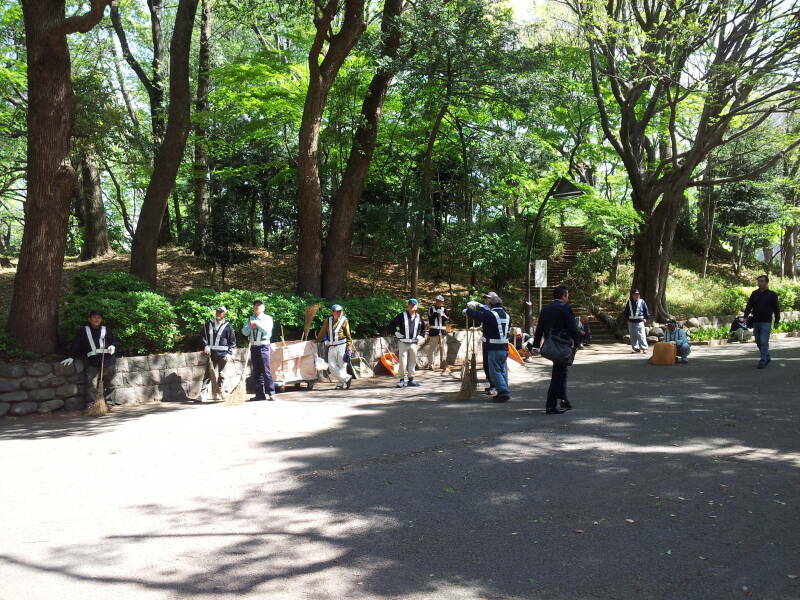 One group of about 2,000 Tokugawa Shōgunate fighters had barricaded themselves within the Ueno complex. These were members of the Shōgitai, a unit of Tokugawa Shōgunate military retainers. They were holding the Kan'ei-ji abbot as hostage, and this had kept the revolutionary forces from attacking. On the early morning of July 4th, artillery rounds fired from Hongo's heights began falling on Ueno. In the late afternoon, revolutionary forces broke through the defensive lines. Meanwhile, most of the artillery rounds had fallen astray, causing fires that destroyed most of the Kan'ei-ji temple complex and about one thousand homes. The Meiji Restoration returned the Emperor to power after almost six centuries as just a figurehead. The Buddhism favored by the samurai class and the Shōgun was suppressed. The Imperial cult recognized the Emperor as the descendent of the gods. Shintō and the government became intertwined. Japan went to war against China in the Sino-Japanese War of 1894-1895. and invaded Taiwan in 1895. It was victorious against Imperial Russia in the Russo-Japanese War of 1904-1905. Japan then invaded Manchuria in 1931, starting what developed into World War II. In the early Meiji period starting in 1868 Japan borrowed many international practices. These included public parks. In 1873, the year after the U.S. established Yellowstone National Park, the world's first national park, the Daijō-kan or Great Council of State called for the establishment of public parks in Japan. They stated that "in prefectures including Tokyo, Osaka, and Kyōto, there are places of historic interest, scenic beauty, and recreation and relaxation where people can visit and enjoy themselves." 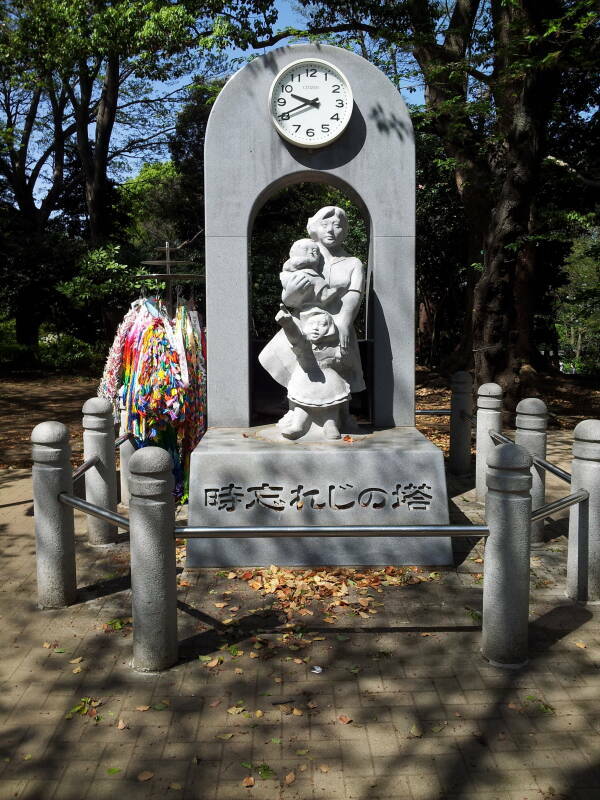 They established Ueno Park, after a fashion, the following year. It was run by the Museum Bureau, then the Ministry of Agriculture and Commerce, and then the Ministry of the Imperial Household. So it was a park, but not a public park in today's sense of a public shared space. Emperor Taishō granted a large tract of land to the city in 1924. 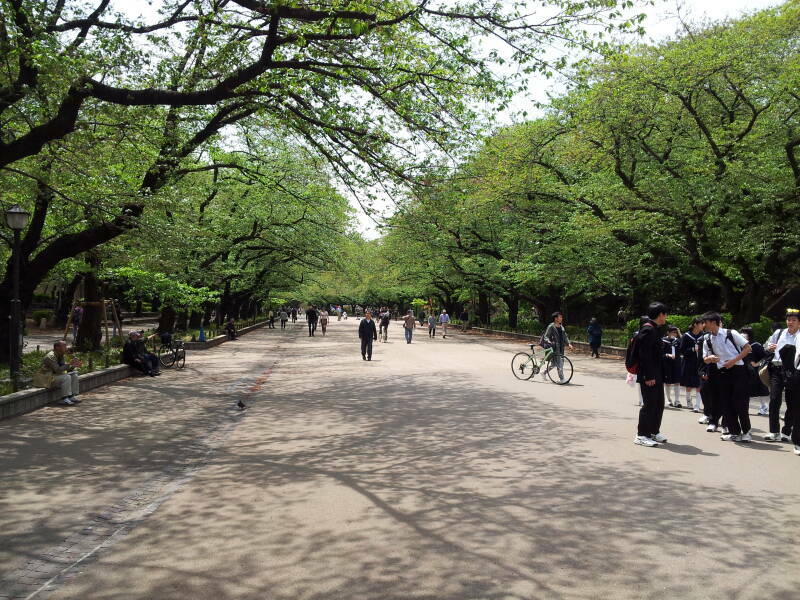 This led to a true public park named Ueno Onshi Kōen or Ueno Imperial Gift Park. Or at least the Emperor, nominally speaking, gave it. Taishō had ascended to the throne in 1912. But he had contracted cerebral meningitis within three weeks of his birth and he was never completely healthy. Today, as any Chicago birth injury attorney can tell you, infant meningitis is considered a serious birth injury which can be fatal if not treated promptly. His neurological problems had worsened and were continuing to degrade when he took the throne. Crown Prince Hirohito was named sesshō or Prince Regent in November 1921. Hirohito became Emperor when Taishō died in 1926. However, he already had been acting as Emperor for the preceding five years. The Japanese words for museum and art were coined in the Meiji period in order to express the western concepts. 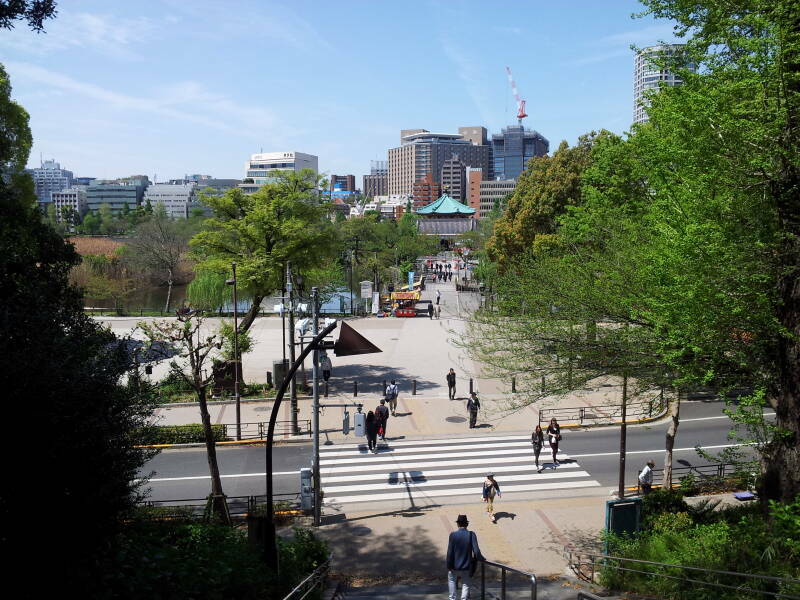 Ueno Park is home to several museums, including the Tokyo National Museum, the National Museum of Nature and Science, the Tokyo Metropolitan Art Museum and the National Museum of Western Art. Schools of art and music, and performance halls for western-style concerts and opera and ballet are also in the park, as well as the Imperial Library. Plus, there are a lot of flowering trees, and nice areas to stroll. 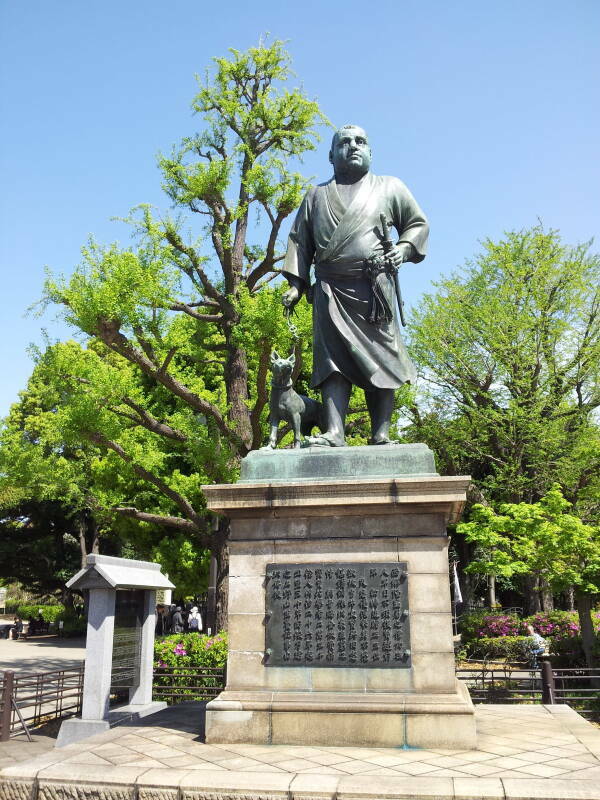 A statue at the southern end of Ueno Park, nearly overlooking Ueno Station, depicts Saigō Takamori and his dog. Saigō is considered to be the last true samurai. The Shōgun Tokugawa Yoshinobu resigned in November 1867. Saigō demanded that the Tokugawa family lose their land and special privileges. His insistence on this led to the Boshin War. He led the Imperial army toward Edo, and personally accepted the surrender of Edo Castle. 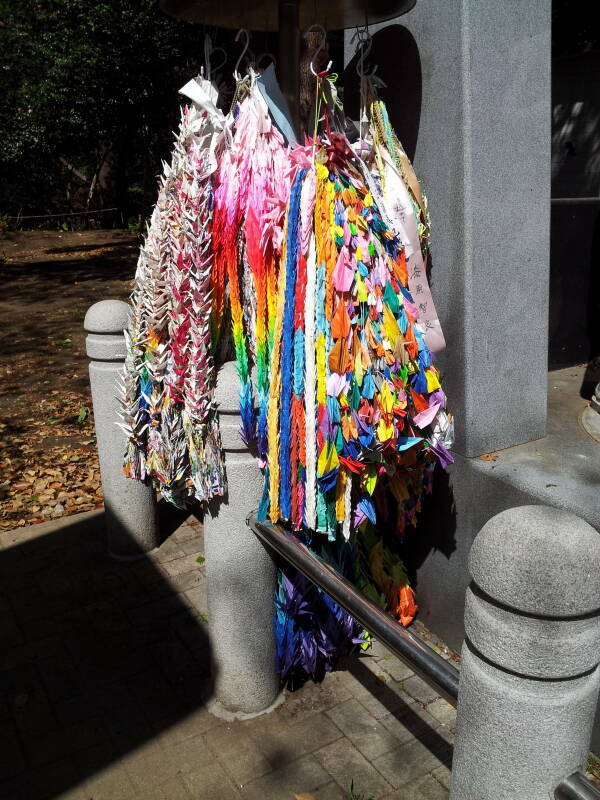 There are many other memorials in Ueno Park. Tōshō-gū was built in 1627 by Tōdō Takatora, and renovated in 1651 by Tokugawa Iemitsu, the third Tokugawa Shōgun. A Tōshō-gū is a Shintō shrine that enshrines Tokugawa Ieyasu (1542-1616) with the name Tōshō Daigongen. He was the founder of the Tokugawa Shōgunate that ruled Japan from the Battle of Sekigahara in 1600 until the Meiji Restoration in 1868. Two other Tokugawa Shōguns are enshrined here, Tokugawa Yoshimune and Tokugawa Yoshinbu. Ieyasu maintained diplomatic relations with the Netherlands, Spain, and England. 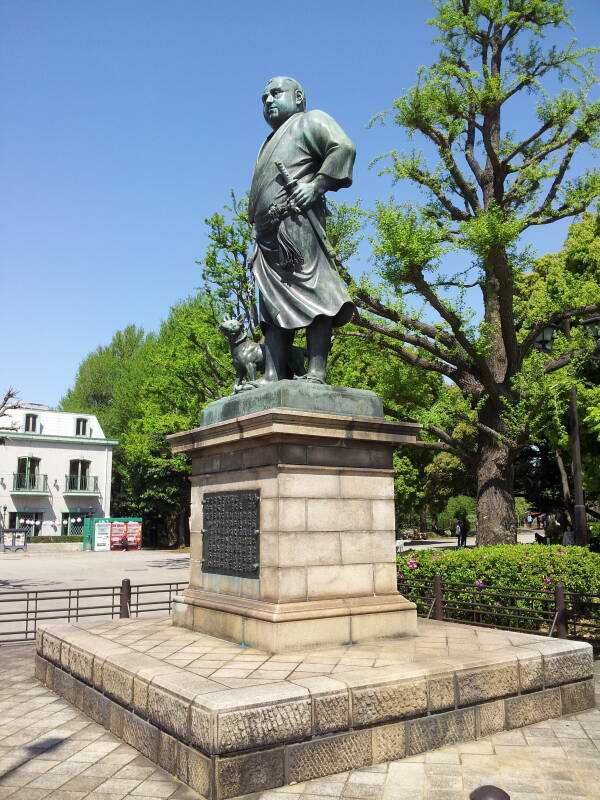 He began restricting contact with Europeans in 1609, although he allowed the Dutch East India Company to maintain a base on an artificial island in Nagasaki's harbor. In 1614 the Shōgun's concerns over Spain's imperial ambitions led him to sign the Christian Expulsion Edict. He had observed Spain's invasions in the Philippines and the Americas. He expelled all foreign missionaries and banned the practice of Christianity. The shrine was part of the Tendai Buddhist temple Kan'ei-ji until 1868. 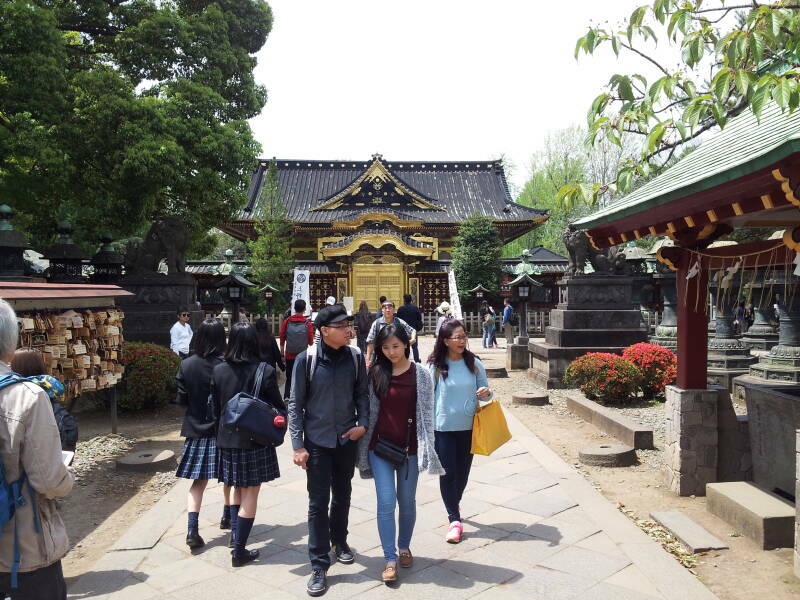 Buddhist temples and Shintō shrines were blended during the centuries of the Shōgunate. 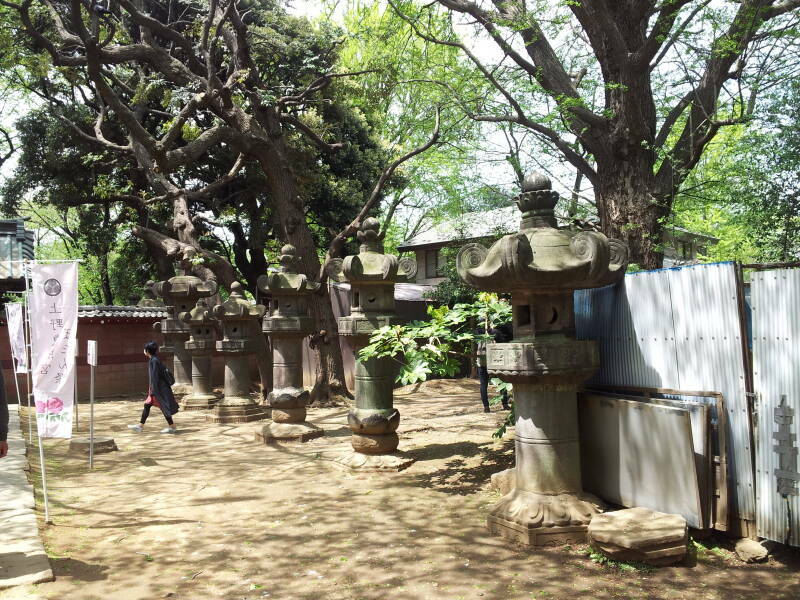 Small Shintō shrines would be built on the grounds of Buddhist temples, and vice-versa. A local Shintō kami or spirit would be seen as the local manifestation of a Buddhist deity. The karamon is a gate with a specific type of curved gable. Its pillars are decorated with two carved dragons. 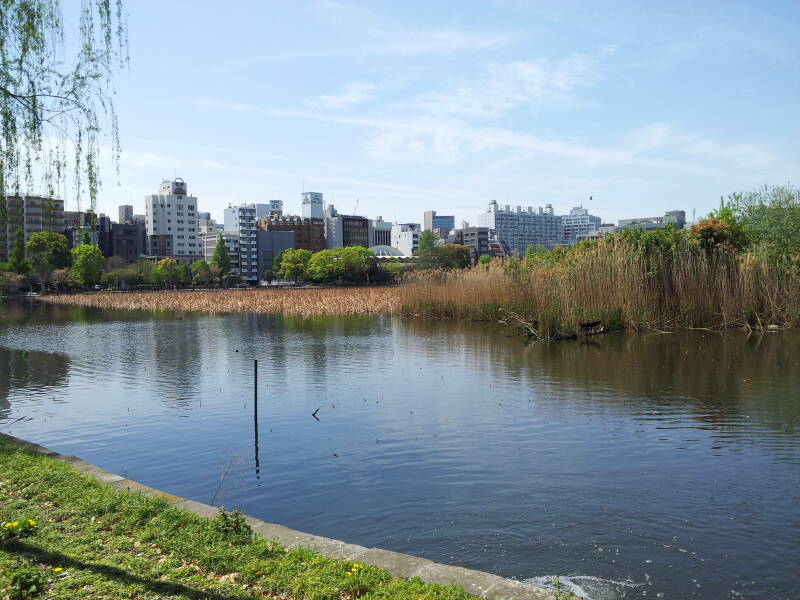 According to legend, they go to the nearby Shinobazu Pond every night to drink its water. 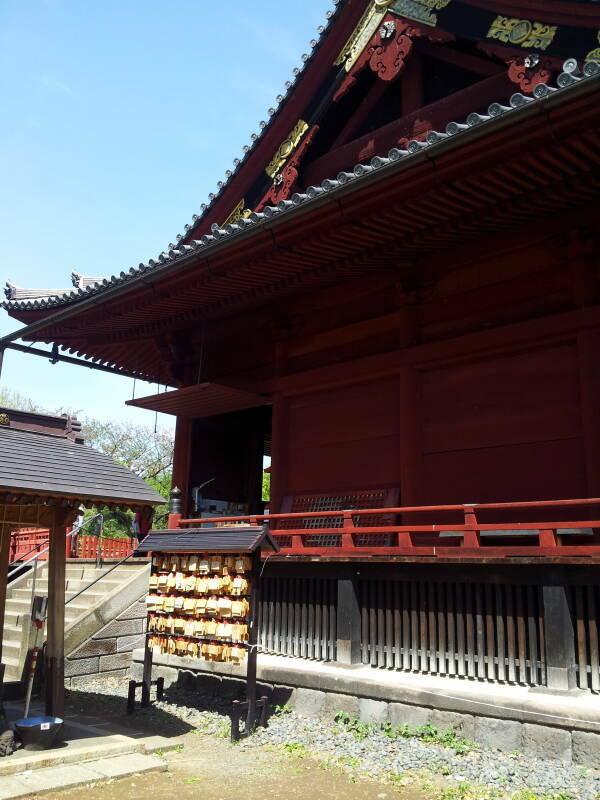 The main hall is a complex Shintō shrine structure. The honden of a shrine is usually at the rear, inaccessible by the general public. The haiden, the oratory or worship hall, is in front of that. 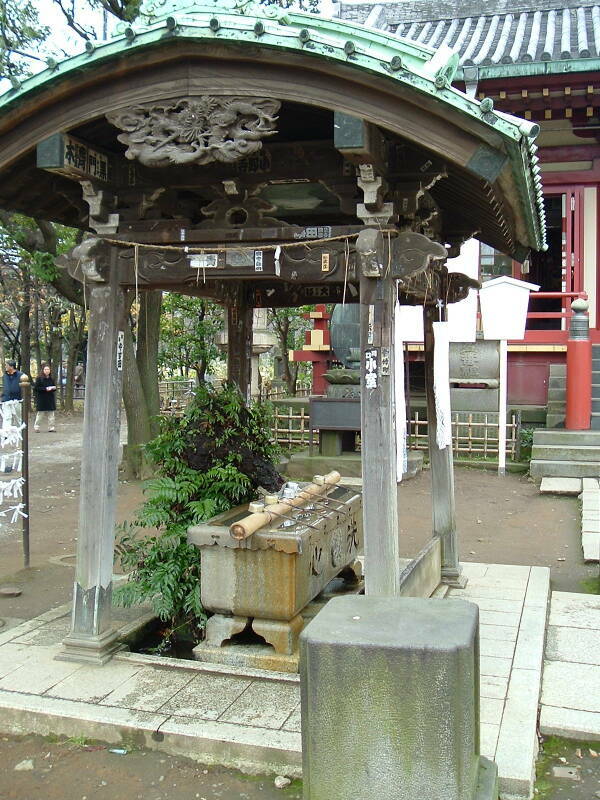 Then in a more elaborate shrine like this one, a heiden or hall of offerings may connect the haiden to the honden. So, it's haiden — heiden — honden from outside to inside. Kiyomizu Kannon-dō Buddhist temple is the Temple of Pure Water, as kiyo (清) means clear or pure, and mizu (水) means water. The current temple was built in 1631. Its design was inspired by the Kiyomizu-dera temple, in Kyōto, although this is a much smaller temple. 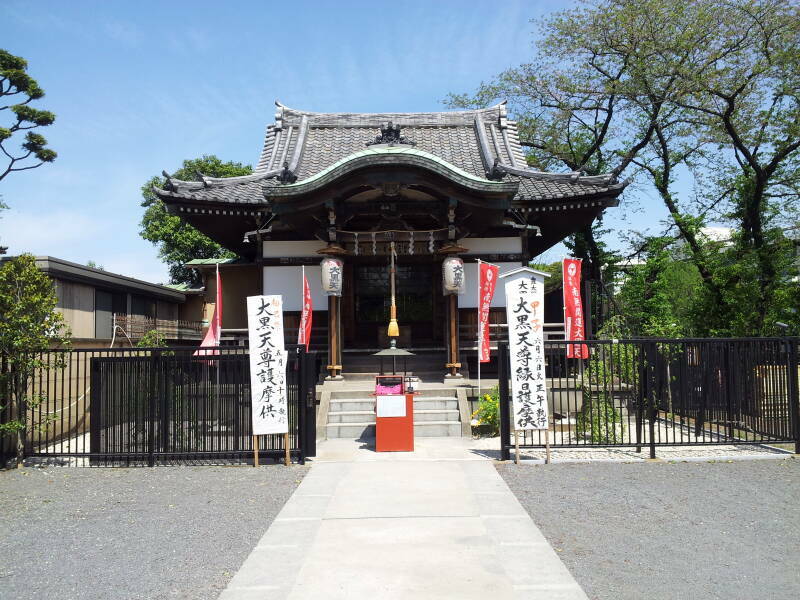 It is one of the oldest temples in Tōkyō, and has been recognized as a national treasure. Its principal image is a seated figure of Senjo-Kannon, the Thousand-Armed Goddess of Mercy. It is a secret image, usually kept in a miniature shrine but shown to the public on a special day in February. The sheltered hand-washing basin is called the chozu-yakata. The basin itself is the tsukubai. That term is based on the verb tsukubau, meaning "to bow down", to humble yourself. A nearby rack holds ema or votive plaques. There are a lot of foreign visitors in Japan. 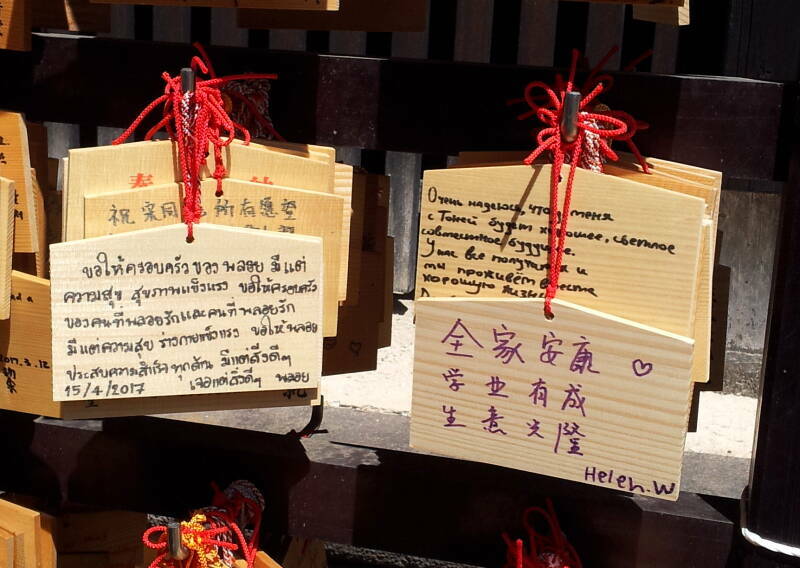 Here are plaques written in Thai and Russian. Another sacred figure here is Kosodate Kannon, the Goddess of Child-Rearing. 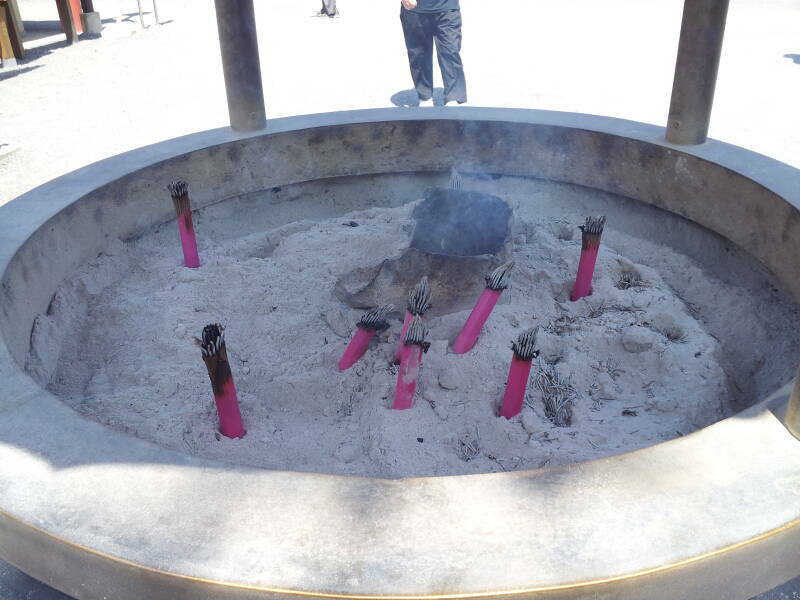 Women who have difficulty conceiving make homage to Kosodate Kannon. Those who have had their wish for a child fulfilled return to the temple, leaving a doll as a gesture of thanks and praying for the good health of their child. All the dolls accumulated over the past year are burned in an annual ceremony on September 25. I think that I would like to see this annual Burning of the Dolls. As soon as peoples' cries of agony reach Kannon, the bodhisattva takes pity on them and saves them from the tortures of Hell. Devotees believe that with sincere prayers offered to Kannon, fire cannot burn them and water cannot drown them. Kannon is believed to be the spiritual child of Amida, sometimes appearing as male, more often female, sometimes androgynous and with a small mustache. Now we have just left the Kiyomizu Kannon-dō and we're looking down from the top of the staircase leading toward Benzaiten Benten-dō Buddhist temple. 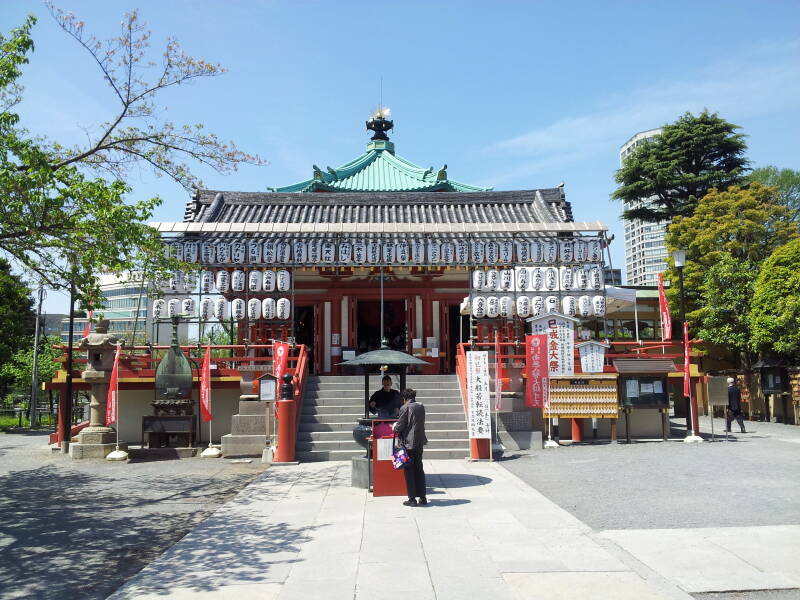 A Benten-dō is a Buddhist temple dedicated to Benzaiten, the goddess of financial success, wisdom, happiness, and music. The Benzaiten temple is on a former island in the small lake Shinobazu-no-ike. Now you reach the temple by a stone causeway. Benzaiten was once the personification of a river. So, Benten-dō are often built next to some body or source of water. A river, a pond, a spring, or even the sea. Or, in this case, the small lake Shinobazu-no-ike. Shinbutsu-shūgō, the syncretism of Buddhism and local kami worship, holds that the Buddhist goddess Benzaiten is essentially the same as the Shintō kami Ugajin. 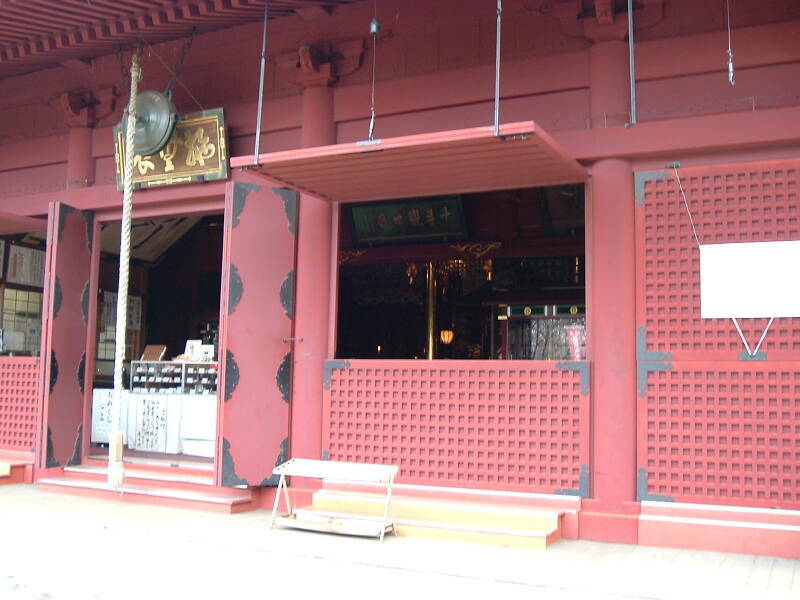 So, Benten-dō can be found at many Shintō shrines, and Buddhist temples often contain a small shrine for Ugajin. The lake is a natural one, although it has been heavily modified a number of times. Once it was even accidentally drained into a subway tunnel when a new line was being constructed and the tunneling accidentally cut into the bottom. In the Jōmon period of roughly 14,000-300 BCE, the area was a cove of what today is called Tōkyō Bay. The sea withdrew in the first few centuries CE. Today the lake is a set of three shallow ponds with an overall circumference of about 2 kilometers. The ponds are shallow, all with average depths of just under a meter. The surface of Hasu no Ike or Lotus Pond is completely covered with lotus plants in the summer. You can rent small paddle boats on Bōto no Ike or Boat Pond. As for U no Ike or Cormorant Pond, that species of birds inhabits that section at certain times of the year. The narrow causeway provides easy access. The causeway is lined with food vendors in the afternoons. It's a nice place for a stroll while watching all the locals doing the same thing. 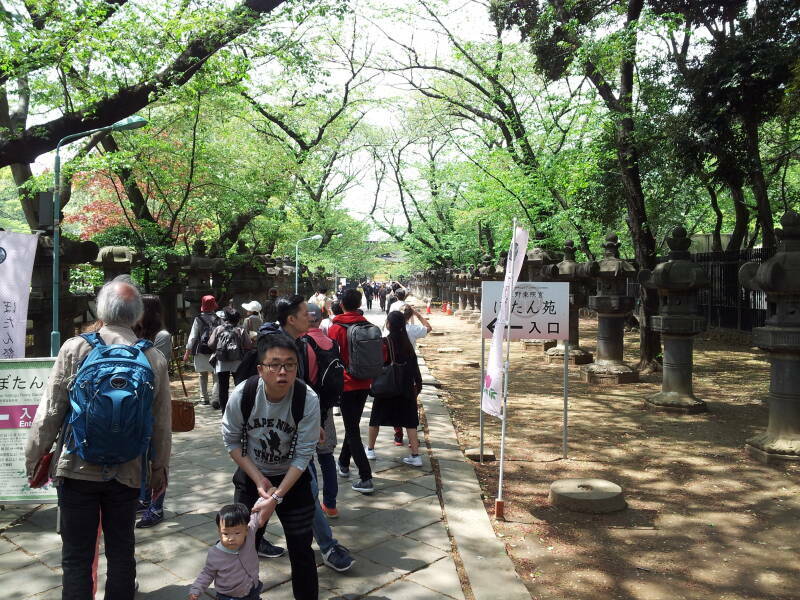 Stone lanterns and statues line the causeway leading to the Benzaiten Temple. Later in the day this will be busy with the many visitors. Food vendors will set up stands along here with snacks and light meals. 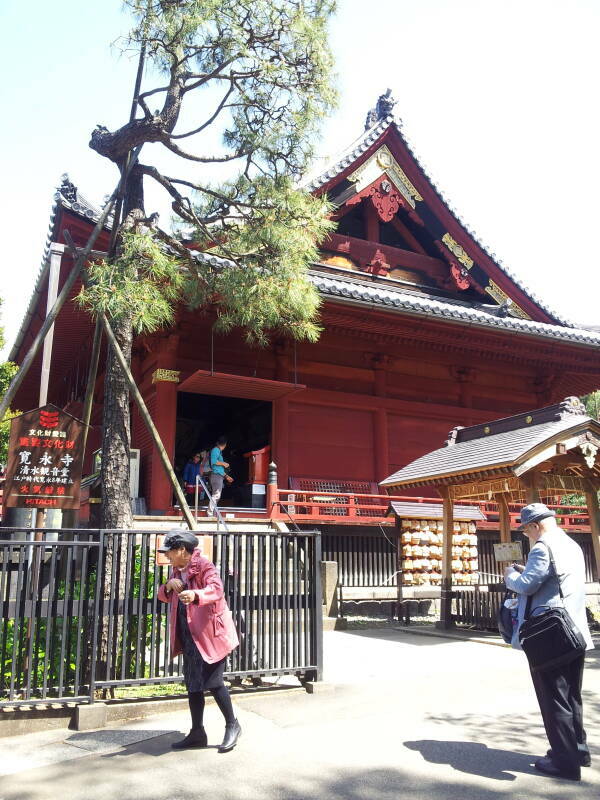 A visiting worshiper has dressed a statue of the Buddhist diety Jizō with a red bib. Jizō is often depicted as a monk with a staff in one hand and a jewel in the other. 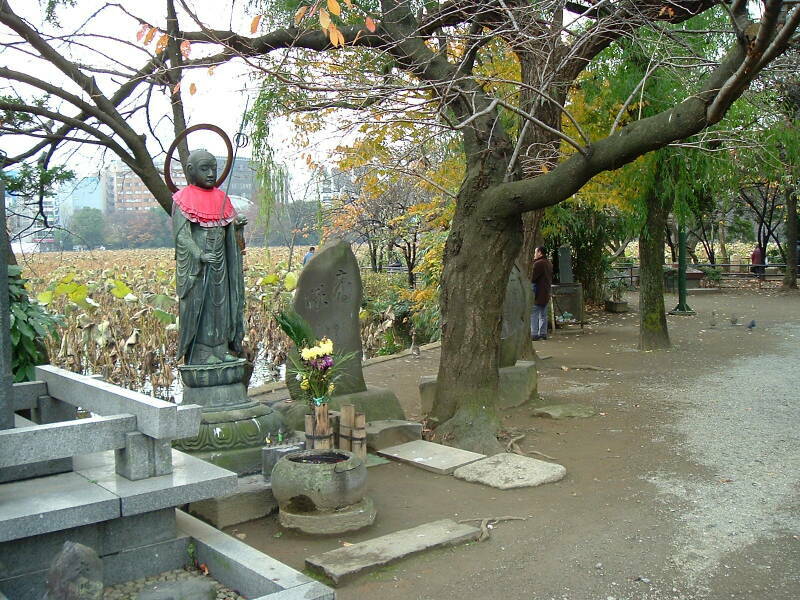 A red bib on a Jizō figure is an attempt to cover the soul of a dead child. My handy Lonely Planet guidebook explained that the female contraceptive pill had not been legalized in Japan until the late 1990s. Up until then it was claimed that because the Japanese people were genetically unique, unlike any other people on Earth, the contraceptive pill used by foreigners would have entirely different and unwanted effects on Japanese women. But then Viagra became enormously popular in Japan, indicating that perhaps the Japanese are not quite as unique as they would like to think. Pressure was brought to legalize the contraceptive pill. Legalization was still a difficult struggle, due to the lobbying of the medical industry which was making a great deal of money off a very high rate of abortion. And hence many of the red bibs. I read about Japanese medical-business details in a Lonely Planet book from the early 2000s, when they were still aimed primarily at independent budget travelers. Now they're aimed at more luxurious travel and, I think, they contain less background information. 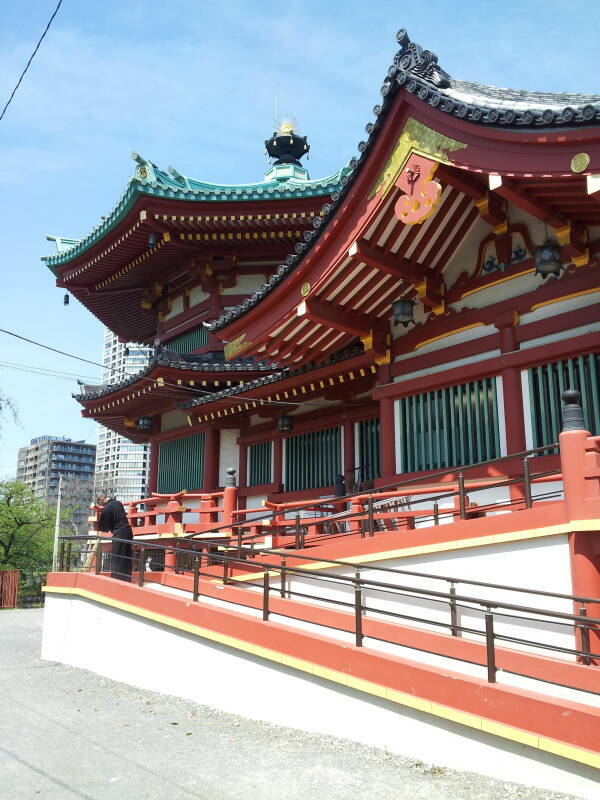 This is the exterior of the Benzaiten temple. Benzaiten is the Buddhist goddess of the arts, knowledge, and wisdom. 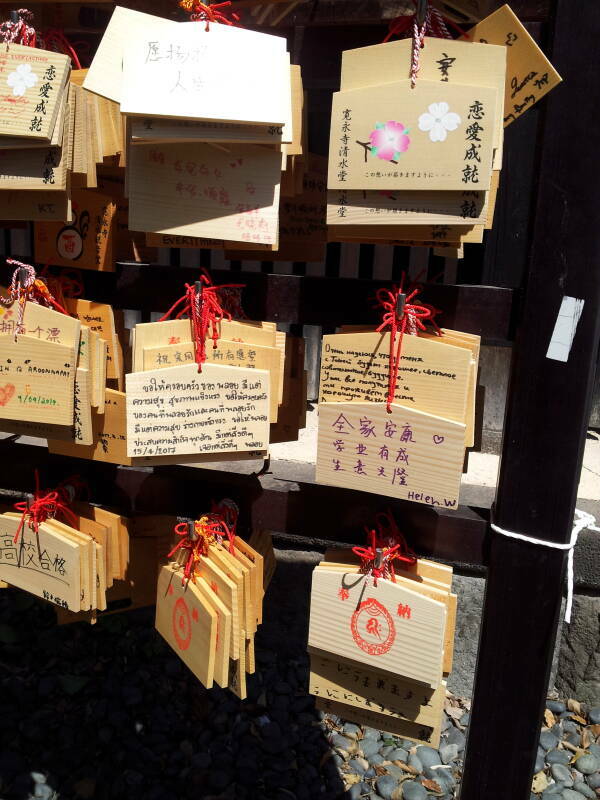 People today make offerings in hope of success in examinations and general good fortune. 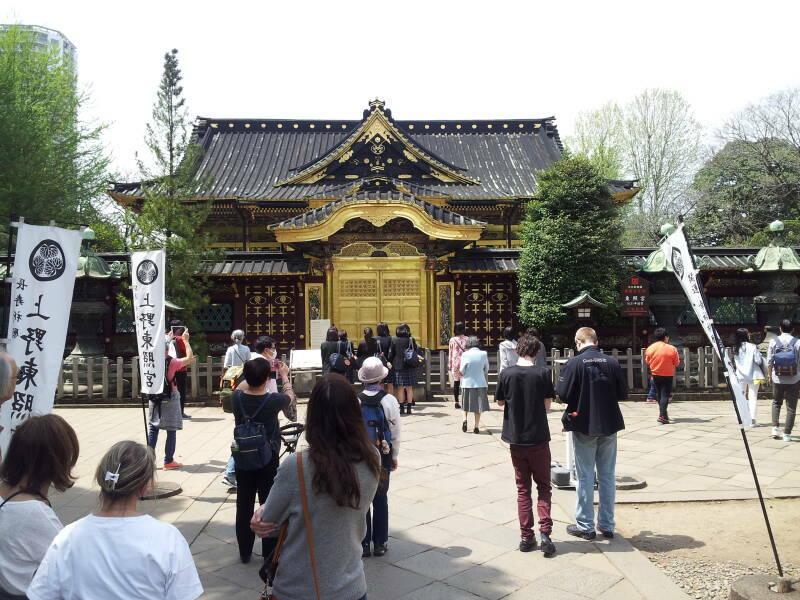 It was built by the daimyo or feudal lord Mizunoya Katsutaka in the early 1600s. The temple was on what was then an island, and access was by boat. By the late 1600s a stone causeway had been constructed. 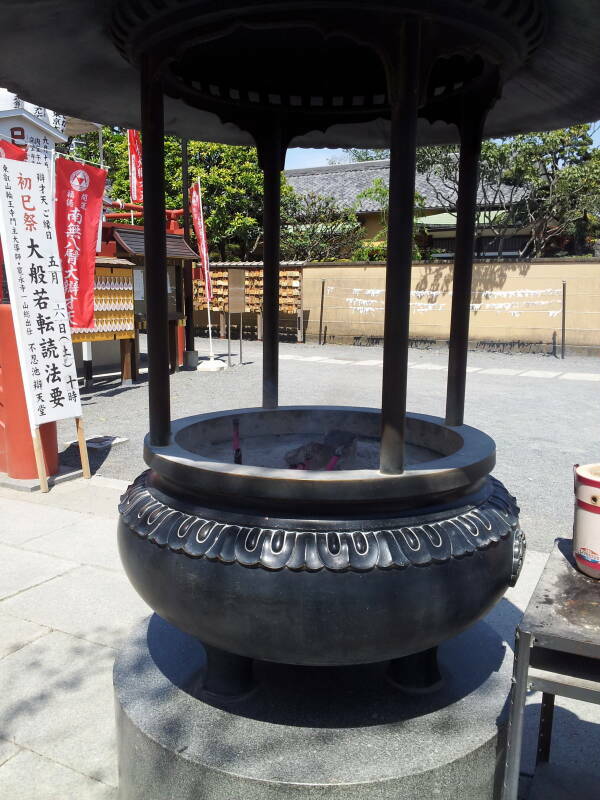 Above and below are the large bronze incense burner. Incense smoke is "the breath of the gods". You wave it over yourself to purify your body before entering the temple. 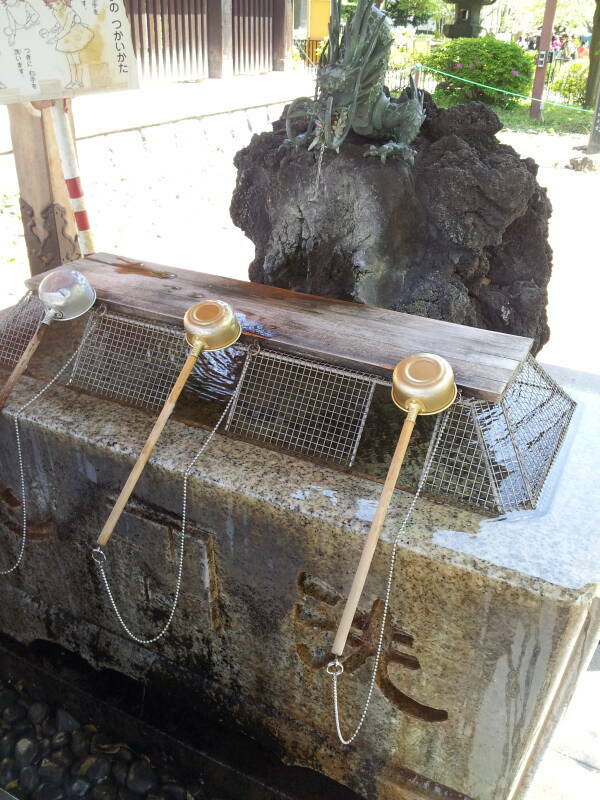 Below is this temple's chozu-yakata or ablutions fountain. As usual, through the syncretism of shinbutsu-shūgō, this Buddhist temple complex includes a Shintō shrine. 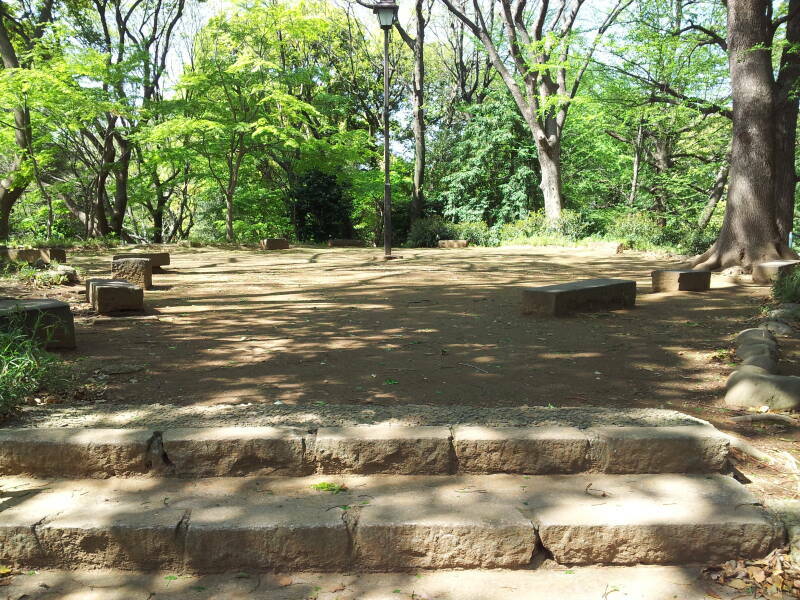 Ueno Park includes a burial mound called Suribachi. It is called this because it looks like a suribachi, an inverted earthenware mortar. It's the tree-covered mound behind these park employees taking a mid-morning break. Yes, it's Mount Suribachi, the same as the 169-meter peak on Iwa Jima (now Iō-tō) in the Ogasawara island chain in the Pacific, and the peak on the Skarvsnes Foreland on Queen Maud Land in Antarctica. Archaeologists have found earthenware of the Yayoi style here, as well as broken pieces of haniwa or clay images. It is thought to be a kofun, a megalithic tomb under a keyhole-shaped mound, dating from about 500 CE. There are many kofun in Japan, especially around Nara where the Imperial house was based in that period. Many are believed to be tombs of Imperial Family members, and therefore they are off-limits to all scientific examination. This one, however, was around the Shōgun's capital of Edo rather than the Emperor's Kyōto, and so it was open to examination. It is about 70 meters long, with the round part 43 meters in diameter. The square end is 23 meters across. The remaining mound is five meters tall. 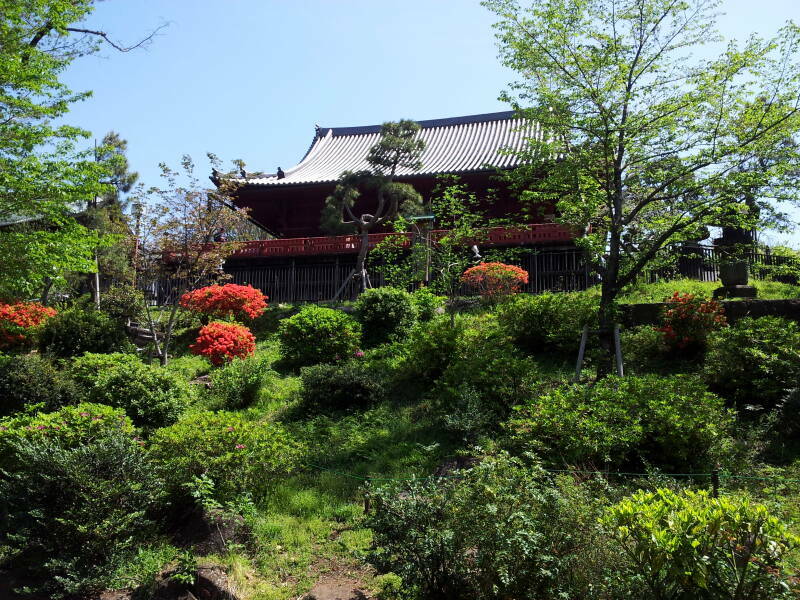 There once was a shrine to Gojo Tenjin on top of the mound, and the Kiyomizu Kannon-dō was once located there. The stereotypical kofun of the Nara area, fancifally associated with the Imperial family, is surrounded by a moat. This burial mound of the Edo area is on a local high point with no moat. The National Museum of Western Art was established in 1959. Its initial collection was based on that of Matsukata Kōjirō, who had died in 1950. Many works from the Renaissance through the early 20th century have since been added to the collection. 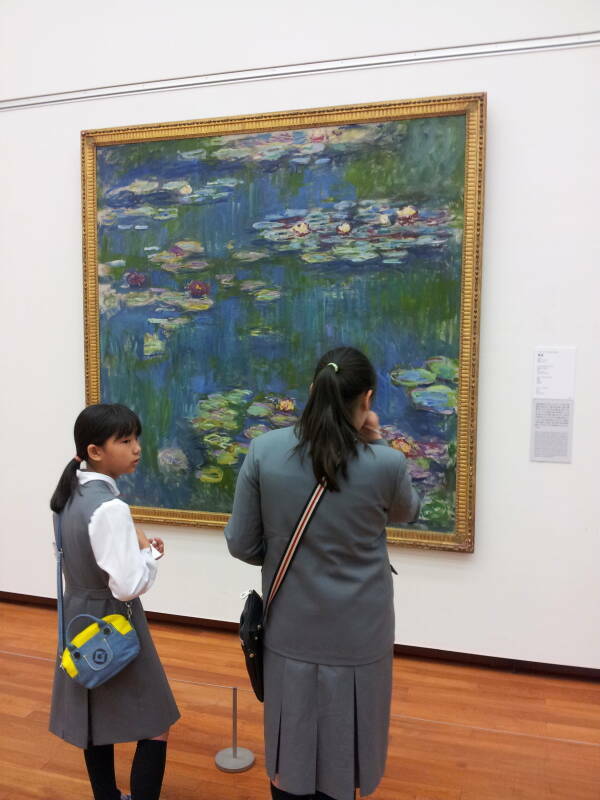 It's Japan's only national institution dedicated to Western art. Prince Matsukata Masayoshi had first studied at a Confucian academy. He then studied western science and surveying in Nagasaki, Japan's most open city by far. He served as Home Minister and Finance Minister for several terms starting in the 1880s, and as Prime Minister of Japan for two separate terms in the 1890s. His son Matsukata Kōjirō was born in 1865. The father sent Kōjirō to the U.S. for his education. He attended Rutgers Preparatory School and Rutgers University in New Jersey. Kōjirō became the president of Kawasaki Shōzō, the Kawasaki Shipbuilding Company, in 1896. He then became the head of Kawasaki Dockyards in 1916. He maintained that position through 1923. He bought thousands of pieces of Western artwork on his travels through Europe, especially in Paris. He hoped that his collection could establish a museum in Tōkyō. He hoped that the residents of Tōkyō could then see great art as easily as the residents of Paris could. 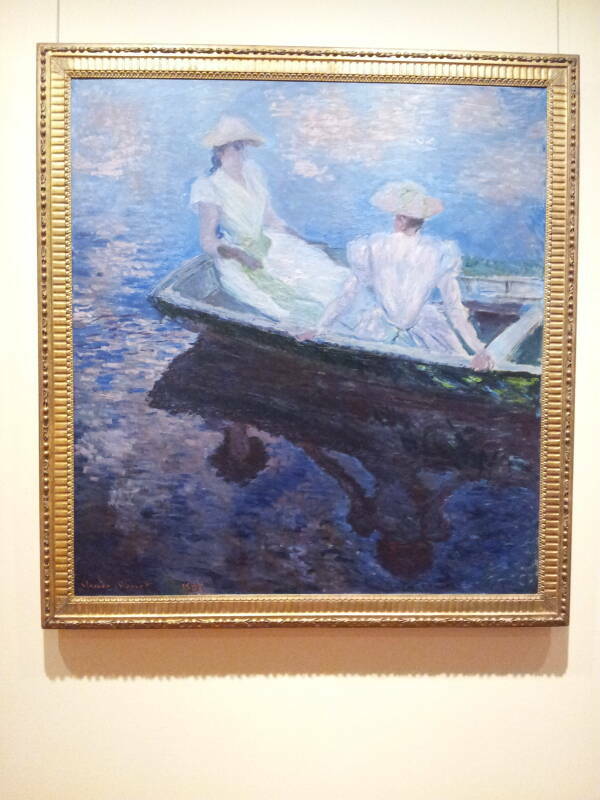 He became close friends with Claude Monet. 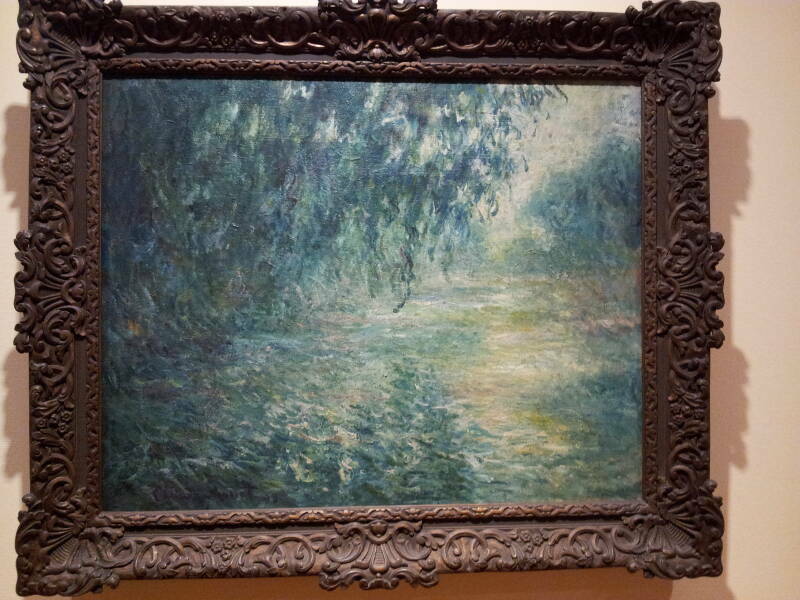 It's said that once when Matsukata visited Monet at his home in Giverny, Monet offered to sell him anything he wanted. Matsukata bought 18 paintings. 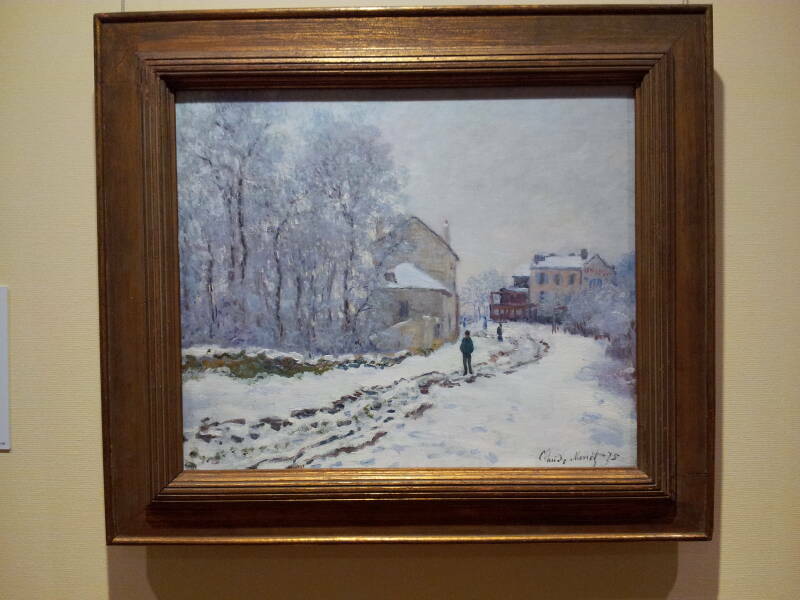 Snow in Argenteuil, 1875, Claude Monet, National Museum of Western Art, Tōkyō. Morning on the Seine, 1898, Claude Monet, National Museum of Western Art, Tōkyō. Economic downturns in the 1920s and especially after 1929 ended his acquisitions, but he kept his collection intact. He only brought a few pieces to Japan, as there was a 100% tax on imports. Some of his collection was stored in Britain, and most of that was destroyed by German bombing during World War II. On the Boat, 1887, Claude Monet, National Museum of Western Art, Tōkyō. 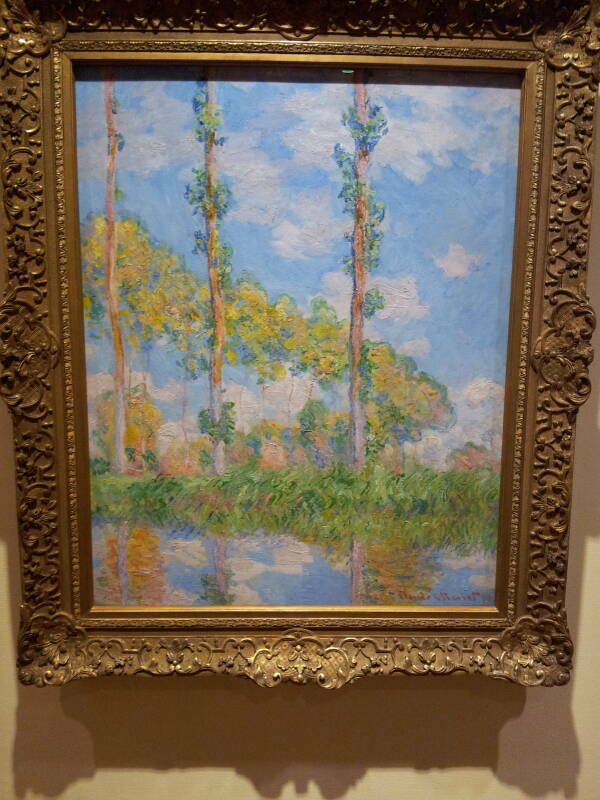 Poplars in the Sun, 1891, Claude Monet, National Museum of Western Art, Tōkyō. He had stored much of his collection in Paris. It was seized as war reparations at the end of World War II. 14 pieces have remained in France, filling gaps in their national collection of works by Monet, van Gogh, Cézanne, and others. France agreed to give the rest of the collection to Japan in 1951, after the Treaty of San Francisco, contingent on the construction of a proper museum. 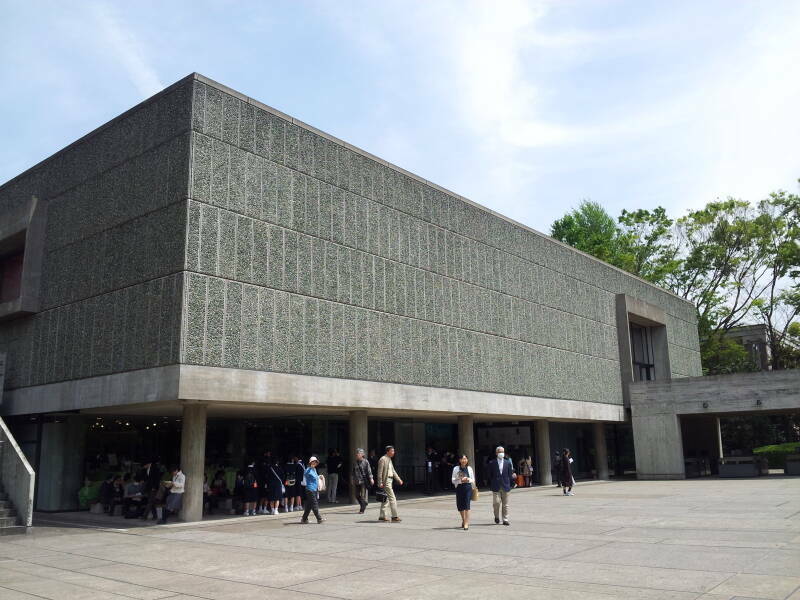 The people of Japan first saw the collection when the museum opened in 1959. 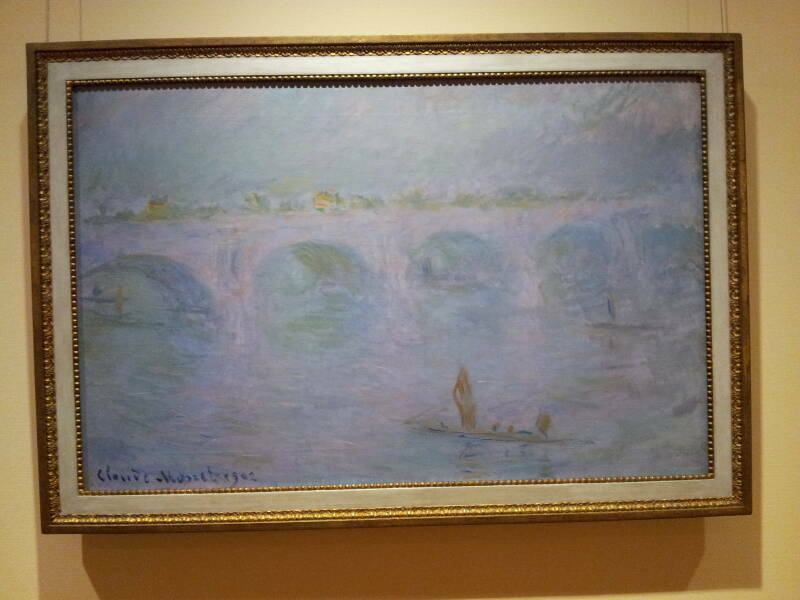 Waterloo Bridge in London, 1902, Claude Monet, National Museum of Western Art, Tōkyō. Water Lilies, 1916, Claude Monet, National Museum of Western Art, Tōkyō. Many of the paintings from the 18th century and earlier feature Christian imagery. I was really hoping that no one would ask me to explain the ahistorical imagery. Saints holding the saws with which they are said to have been cut in two, the spiked wheels on which they were burned, or small versions of the pots in which they were boiled, all traditions with meticulous details of torture and killing, but no historical facts beyond "then they were killed". Or, episodes out of Bible passages with medieval European artistic patrons inserted into the scenes. Or, portrayals of Jesus and his apostles, all of which except John are depicted as elderly men. Or, perhaps strangest of all, the αποθέωσις or apotheosis, the literal conversion of an Italian admiral into a god. Shintō and its belief in the Emperor as the descendant of the gods doesn't seem at all strange when you compare it to The Apotheosis of Washington, the fresco in the dome of the United States Capitol Building. It depicts George Washington ascending and becoming a god. Washington is surrounded in the fresco by Roman deities and mid-1800s technology — the goddess Minerva with an electrical generator and batteries, the goddess Venus helping to install the transatlantic telegraph cable with an ironclad warship in the background, the god Vulcan with a cannon and steam engine, the goddess Ceres sitting on a McCormick mechanical reaper, and so on. It's a very weird mash-up of classical mythology, steam-powered technology, and American creation myth. I was lucky. No one asked.